The distance between him and McKinzie is about the same as the distance that separated them in the San Felipe. He came out of the race 100% and cleaned up his feed, which is the first thing you want to see after such a tough race, especially off a layoff. Credit Ruis for the great job he has done with this colt last year and this. No one will know what missing the San Vicente Stakes will mean in the long run, but you couldn’t ask for a better first race back. 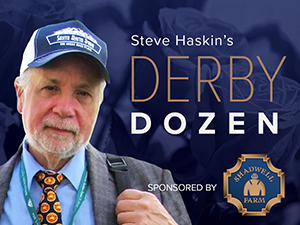 What makes this year’s Derby trail so unusual is it is very difficult to compare top-class 2-year-olds like him, McKinzie and Good Magic to the brilliant lightly raced horses like Justify and Magnum Moon, who could either be at a disadvantage having gotten started so late or they are so gifted, they can catch up much quicker than ordinary horses and it won’t matter come Derby Day. So it looks like it will be McKinzie and Bolt d’Oro round two in the Santa Anita Derby. Their slugfest in the San Felipe helped toughen both colts and is the kind of first race you want when you’re having only two preps. But now that they have that race under their belt, they really don’t need to gut each other again. But can they avoid it? When you pit two warriors together who appear to have equal ability and equal tenacity, it is difficult to prevent them from going at each other’s throat. Neither trainer wants to back off a little in their final prep, but even if they did, chances are these two are going to eyeball each other once again. One good thing is that both colts definitely will be battle tested going into the Kentucky Derby, which might not be the case with these whiz kids trying to take over the reins in the 3-year-old division. He has turned into the most polarizing horse on the Derby trail. Some feel he was not a true champion with only one win and cite the fact he has now lost three of his four starts. Others feel he was something special last year and still is, while some thought he was special, but now have second thoughts after his Holy Bull defeat. Pick one. No matter how you feel about him, we won’t know the answer until he runs in the Blue Grass Stakes. Will he return to his form of the Breeders’ Cup Juvenile and Champagne Stakes when he did things maidens are just not supposed to do or was his performance in the Holy Bull and indication he was a brief 2-year-old wonder? Judging by his overall speed figures, the feeling here is that his race wasn’t as bad as it might have seemed at first and that he will move forward off it and return to his championship form. How that stacks up against the horses who are already surging forward we will soon find out. For now, he is still the champ and he hasn’t been dethroned quite yet. Yes, I know, what is he still doing up this high with so many brilliant performances and exciting newcomers this year? After all, no one has him ranked among the top 3-year-olds. I know I’m being stubborn, but sometimes if you think highly of a horse you have to give him a couple of races to prove you right or wrong. And the Florida Derby against some very fast horses on a usually speed-favoring track will do just that. If he’s coming in the stretch and can pick up a good chunk of it, then he should be set up well for a peak performance on Derby Day. He turned in a strong five-furlong work in 1:00 flat at Bridlewood Farm with Irad Ortiz up, and will work next week at Gulfstream. He has put together back-to-back triple-digit late pace figures on Brisnet, and earning a 102 late pace figure in the Sam F. Davis Stakes after a 96 middle figure showed he can come home fast after going at a strong pace . He also earned a career best Ragozin number and equaled his career best Thoro-Graph number, so he is not without credentials. Here we go again with another lightly raced horse trying to buck history, as he will attempt to become the second horse in the past 100 years to win the Kentucky Derby with only four career starts, and, like Justify, attempt to end the curse of Apollo. But you can no longer ignore these lightly raced horses. He passed the eye test in his maiden victory and he carried it over into graded stakes by showing a professionalism that defied his inexperience. To track the pace in the Rebel Stakes and come home his final sixteenth in 06 1/5 while drawing off from a solid field of stakes horses, including Solomini, was very impressive. He does have that extra start on Justify, has proven himself in top-quality competition, and has a race over the Oaklawn track, and that could give him a slight advantage when they square off in the Arkansas Derby. He has not shown the sheer brilliance of Justify, but there is no doubt he is one very classy colt who took a major step forward on Saturday. As I remarked about his allowance score at Tampa, it looked like an in-company workout the way he cruised by the two leaders with his ears up and the rider sitting motionless. To come back and dominate this solid a stakes field shows he, too, is an exceptional talent, and he does have the look of a Derby horse. Get ready Arkansas, here comes Justifly. Yes, I am old school and believe in historical trends, at least to a degree, but some things, logical or not, cannot be ignored, and when you hear terms like “breathes different air” and “man among boys” and “leaves you lost for words” from respectable horsemen, you better start taking him seriously before he jumps up and bites you in the you know where. So for now he keeps creeping up the rankings until a revelation hits me just what we are dealing with and whether it is time to simply ignore the fact he’s never run in a stakes, has only two career starts, and hasn’t faced any competition able to make him take a deep breath; and whether it is time to ignore the so-called 136-year-old Apollo curse and the fact that only one horse in the past 103 years has won the Kentucky Derby off only three career starts, and that horse, Big Brown, did race at 2 and all three of his races were at a mile or longer. From everything we’ve seen so far, Justify could be that much of a freak that he makes all the above meaningless. We should find out when he takes on Magnum Moon at Oaklawn Park in the Battle of the Budding Superstars. He worked five furlongs in 1:01 2/5 in company and was being roused a bit coming to the wire and galloping out. His brilliant victory in the Holy Bull Stakes seems so long ago, and he now has been overshadowed by the big guns in California. But if he can duplicate that effort, you have to put him right up there even with distance questions. And it is those distance questions that has him ranked where he is, and below his own stablemate Magnum Moon. We know Into Mischief needs stamina in the dam, and with him it is a question whether the Easy Goer – Classy Cathy mating farther back can overcome the Gilded Time – Timeless Moment connection. But you never know with the Damascus line. There certainly is stamina there. The Florida Derby should tell us a lot after we see how he handles the stretch out to 1 1/8 miles. Then we’ll start thinking about 1 1/4 miles. But as I mentioned last week, some of his Brisnet late pace figures have been sensational, so we know he can come home. We’ll just see if he can come home that strongly at longer distances. Brisset has always been high on this colt, but he had to get over some issues of immaturity, as he showed in his second career start when he raced very greenly down the stretch, yet still drew off to win by 6 1/2 lengths. But he made tremendous progress from 2 to 3 and it showed in his courageous and classy victory in the Tampa Bay Derby over two horses who had already excelled over the Tampa track. Most people might not know much about Brisset, but he has been around a number of top-class horses working 10 years for Bill Mott and before that Patrick Biancone and Alain de Royer Dupre. For him to have a horse of this quality for WinStar Farm just a year after going out on his own shows how highly he is regarded by major owners and breeders. It is so difficult to get a grasp of this colt, because he has never been able to use his talent to its full degree, and that has cost him on several occasions. He had bad racing luck in the Rebel Stakes trying to come through on the rail and getting sideswiped, which allowed Magnum Moon to get a huge jump on him after turning for home. He dug in and ran well to get second, holding off the late-running Combatant, but if he can’t learn how to switch leads it’s going to be difficult taking that next big step forward. He had shown big improvement in his latest work, but still was stuck on his left lead the length of the stretch. He is always going to be dangerous wherever he runs, and we’ll see how professional he is when he either takes on his old rivals Bolt d’Oro and McKinzie in the Santa Anita Derby or heads to New York for the Wood Memorial. If he is going to show that quickness and a decent enough turn of foot to outckick top-class horses, the one turn-mile of the Gotham Stakes could have been just what he needed to bring that out when he stretches back out to two turns. He is more one-paced, but can keep coming at you, and his 95 Beyer speed figure in the Gotham was a big step forward. What he has going for him now is his consistency and the look of a class horse. He seems to have gotten lost in the barrage of big performances in California and has become a forgotten horse following his defeat in the Risen Star Stakes (G2). So do you stay home and take on Bolt d’Oro and McKinzie as announced or hit the road again? He’s much better than he showed in his last race, and there should be improvement expected wherever he goes. However, following a sharp :59 1/5 work, he has turned in two very slow works in 1:03 2/5 and 1:17 4/5, so we’ll see how Holledorfer trains him as he gets closer to a race. Now that he has shown he is effective coming from off the pace against top-quality horses, all he needs is to show he can win from off the pace and not run spotty like he did in the Tampa Bay Derby. You want to see him more responsive on the far turn and not have to be pushed hard to keep up. But I feel that will improve as the distances stretch out. He did find his best stride late in the Tampa Derby, so that is something he can build on. And we have seen on several occasions how tenacious he is on the lead and how difficult he is to pass. Someone had to drop off with the impressive victory of Magnum Moon, and it had to be PROMISES FULFILLED, whose brilliance cannot be denied, but he still has to prove he is not a one-dimensional speed horse, considering he has been on the lead in all four of his career starts. He obviously can carry his speed, but we have seen how rare it is for a horse to wire the Kentucky Derby unless they are left all alone on an uncontentious lead, and we know you cannot count on that. Trainer Dale Romans has already issued a warning to other speed horses that he is going to be gunned out of there in the Florida Derby and Kentucky Derby, so we will see what the result of that will be. Well, good old reliable COMBATANT ran another big race in defeat, this time just missing second behind Solomini in the Rebel Stakes. One of these days things will fall into place for him and he will be able to put the finishing touches on his stretch run. But for now, he is just a notch or two behind the top tier horses. But there was a horse who he reminds me of in some ways who was able to put it all together and peak on Derby Day after a series of similar defeats and that was Giacomo, so you never know. Of the others, TITLE READY ran hard as far as he could setting the pace and did well to hang on for fourth. Wayne Lukas was sure he had SPORTING CHANCE sitting on a huge race and was disappointed when last year’s Hopeful Stakes turned in a flat effort, finishing a non-threatening fifth, but only beaten 5 3/4 lengths. He will be given another chance in the Arkansas Derby. Two results that shouldn’t have much of an impact on the Derby picture were the victory by BLENDED CITIZEN in the Jeff Ruby Steaks at Turfway Park and VIP CODE’S 36-1 upset of the Private Terms Stakes at Laurel. Blended Citizen just got up to defeat the Todd Pletcher-trained PONY UP by a neck and looks to be a closer with a bright future, but will have to make the transition from synthetic to dirt if trainer Doug O’Neill wishes to pursue the classic route. On the same card, ALTERNATIVE ROUTE looked good winning the Rushaway Stakes by 1 3/4 lengths after stalking the pace in second. Al Stall trains the son of Tiznow. All eyes were on the brilliant maiden winner TENFOLD in a 1 1/16-mile allowance race at Oaklawn Park Sunday, and unlike his dominating front-running score in his career debut, he showed his gameness by tracking the pace and outdueling the Pletcher-trained NAVISTAR to score by a neck at 3-5. His time was 1:44 flat compared to the 1:42 3/5 of the Rebel. At Aqueduct, CALIFORNIA NIGHT, fifth in the six-furlong Jimmy Winkfield Stakes, stretched out succesfully, wiring his field in a one-mile allowance race, winning by 2 3/4 lengths in 1:40 2/5. Several workouts to pay attention to were BRAVAZO’S five-furlong drill in a bullet :59 3/5, fastest of 26 works at the distance, and a bullet :59 2/5 breeze by the enigmatic HOLLYWOOD STAR, fastest of 15 works at the distance. And at Santa Anita, ALL OUT BLITZ, who scratched out of Justify’s allowance race last week, blazed his five furlongs in a bullet :58 2/5. One horse Bravazo will have to deal with in the Louisiana Derby is the Southwest Stakes winner MY BOY JACK, who drilled five furlongs in 1:00 2/5. Another is NOBLE INDY, third in the Risen Star Stakes, who breezed five furlongs in 1:00 3/5. Pletcher also will run HYNDFORD, second to Magnum Moon last time out at Tampa Bay, unless he finds out for sure before the plane leaves for Louisiana that the colt will not be on the also-eligible list for the Sunland Park Derby, which he is right now. Another top Louisiana Derby contender, SNAPPER SINCLAIR, breezed a half in :49 1/5. At Santa Anita, RESTORING HOPE drilled five furlongs in 1:00 2/5 for the Sunland Park Derby. A big race and Bob Baffert could have a powerful four-horse entry for the Kentucky Derby. Fountain of Youth Stakes runner-up STRIKE POWER breezed a half in :49 1/5 for the Florida Derby, which looks to be shaping up as a competitive race, with some classy quality speed and tactical speed horses expected on a racetrack that usually favors their style of running. Todd Pletcher breezed MARCONI and BIBLICAL a half in :50 1/5, and at Gulfstream Park. STORM RUNNER, who will join Promises Fulfilled in the Florida Derby, worked a sharp five furlongs in 1:00 4/5. Two horses looking to make comebacks from injuries, MASK and GREYVITOS, breezed a half in :49 and six furlongs in 1:15 3/5, respectively.